N'Golo Kante celebrates scoring against Manchester City in a 2-0 win for Chelsea. Manchester United are back to winning ways, while their noisy neighbours of the north west suffered their first defeat of the Premier League season. At the other end of the country, south coast side Bournemouth were thrashed by Liverpool, with Mohamed Salah bagging a sensational hat-trick. Here's a wrap of all the Premier League action! 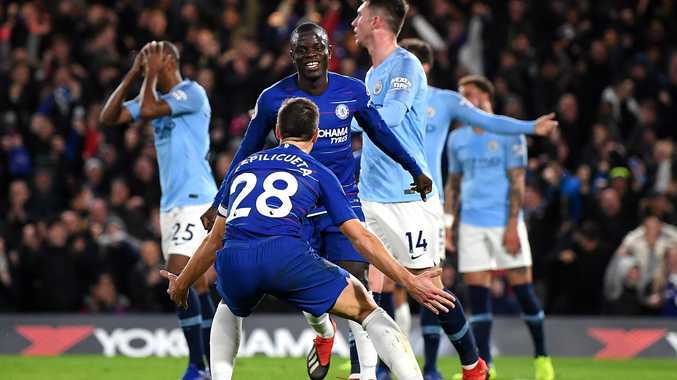 Chelsea inflicted Manchester City's first loss of the Premier League season on Saturday, winning 2-0 as the champions were replaced by Liverpool in top spot. After losing two of its last three league games, Chelsea was forced to repel waves of City attacks before N'Golo Kante scored from the team's first shot on target in the 45th minute. Buoyed by going in front, Chelsea controlled the second half and David Luiz headed the hosts further in front in the 78th. It ended City's 21-game unbeaten run in the league stretching back into last season when Pep Guardiola's side won the title with 100 points. Mohamed Salah scored his first hat trick of the season as Liverpool beat Bournemouth 4-0 to equal its club record of 17 Premier League matches unbeaten. Despite a hint of off-side, Salah broke the deadlock in the 25th minute as he tucked away a parried shot. Salah scored again three minutes into the second half in an example of perseverance over play-acting, with the striker refusing to go down under a challenge from Steve Cook before drilling home in style. Liverpool took a three-goal lead thanks to an acrobatic own goal in the 68th from Cook, before Salah completed his hat trick by keeping his cool in front of goal after a mazy dribble to complete the rout in the 77th. Unai Emery praised the increasingly influential Lucas Torreira after the Uruguayan midfielder's late goal secured a 1-0 win for Arsenal against a resolute Huddersfield on Saturday. The Gunners stretched their unbeaten run to 21 games but had looked set to drop two points at the Emirates Stadium before Torreira's spectacular overhead kick seven minutes from time. The 22-year-old has largely been viewed as a defensive guard for Arsenal's back four, yet two goals in the past week justifies Emery's faith that he can be effective at both ends of the pitch. Jose Mourinho answered his critics - for the time being at least - as his Manchester United side recorded their biggest league victory in 13 months with a 4-1 win over Fulham. Ashley Young, with his first goal in over 12 months, Juan Mata and Romelu Lukaku shot United into a commanding first-half lead. But they struggled to add to that advantage after the break, even after Fulham were reduced to 10 men following the dismissal of Andre-Frank Zambo Anguissa, moments after Aboubakar Kamara had pulled a goal back from the penalty spot. Eventually, United were able to do so, completing the rout in the 82nd minute when Marcus Rashford beat Fulham keeper Sergio Rico at his near post with a curling shot from the edge of the area. Third-placed Tottenham moved to within six points of top spot - and remained two points ahead of fourth-placed Chelsea - thanks to a 2-0 win at Leicester. Son Heung-min's brilliant long-range left-footed effort opened the scoring on the stroke of halftime and Dele Alli headed home a cross from the South Korean to make it two in the 58th minute.